We do live in the tropical rainforest. It is just a bit hard to nitice when it has been turned into hauses and roads. Yesterday we went to Lekki Conservation Centre where a tiny bit of the tropical rainforest is preserved. We were looking at mangrove trees and strangler figs. When animals eat the fruit from the strangler figs, seeds are passed out in the droppings and ends up on a branch in a tree. When the seeds germinates and sends roots downwards they establish themselves in the existing tree, and will eventually strangle and kill the tree, and win the race for light. Sofie was very fascinated by gekkos and lizards of every kind. She stopped at each and everyone we passed on our way. It did not matter that we have the same lizards and gekkos at Banana Island close to our home. We did hear the monkeys and feel their presence several time, but there were only one spot were we could see several of them clearly. They kept their distance. 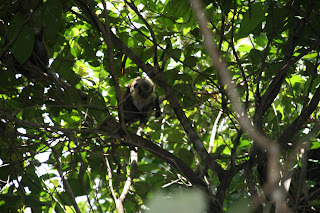 One of the monkeys were curious of Sofie and came closer and closer to watch her when we moved a bit away. But when she took out the camera it went back to the top of the tree. We did get a few pictures, but not any good ones. When we stopped to watch some young monkeys in a tree, the mother hid and startet to make a lot of noices so we should turn the focus towards her. Even if we were aware of this old trick, it worked. We just had to see where she were - and the kids hid. Lekki Conservation Centre had well developed trails above the ground so we could walk safely in the swamp areas. But half of the area had thei walk way flooded so we need to come back another time, after the end of the rainy season to see the rest.